The Appeal Court of North Carolina has unanimously turned down an appeal against a decision by the North Carolina Utilities Commission to allow the inclusion of wood chips derived from low-value whole trees in the state's renewable energy definition. A life-cycle assessment comparing biomass power to coal power shows biomass emits just 4 percent of the carbon dioxide coal power emits. The report also found that sustainably managed forests are better than carbon neutral. A lawsuit filed recently by a number of conservation groups challenges the U.S. EPA's three-year deferral of biogenic emissions under the Greenhouse Gas Tailoring Rule. The agency has said it will use that time to further study the issue. Kiara Solar LLC, a California-based power generation company, plans to restart a dormant biomass power plant in Anderson, Calif. The plant was purchased from Siskiyou Forest Products, a wood processing company in Anderson. Faced with increasing pressure to reduce emissions, the Rio Tinto Alcan Lynemouth Aluminum Smelter, located in Northeast England's village of Lynemouth, is considering a switch from coal power to biomass at its on-site 420-megawatt power station. 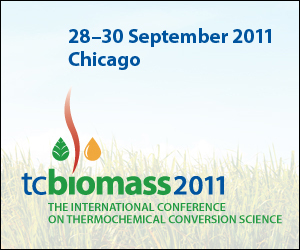 Although biomass-generated energy provides significant benefits, it has not been without controversy. The BTEC will hold a webinar on Aug. 30 to addresses issues such as emissions, feedstock sustainability and incentives for biomass systems. Forest Concepts LLC developed two baling systems scientifically engineered for woody and tall grass biomass. The balers were designed to solve the problem of using agricultural balers for biomass purposes. Over the 20-year term of its proposed biomass combined-heat-and-power plant, Clark County, Wash., will receive a total benefit of more than $11 million and be capable of extending the life of its existing equipment, according to Clark County. 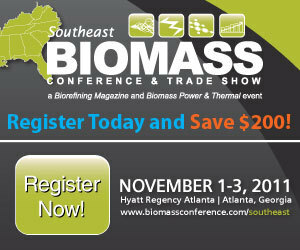 A 56-megawatt biomass power plant slated for operation in October 2012 will be Georgia's largest, located on an industrial site in southeast Laurens County near Dublin.